Add all dry ingredients in a mixing bowl except for chocolate chips. In microwave heat almond butter, then peanut butter until melted. Pour into mixture. Heat honey in microwave (approx. 30 sec). Pour into mixture. Stir well. Pour into a 9x9 pan and press firmly with spatula until formed in pan. Add chocolate chips on top if you would like. 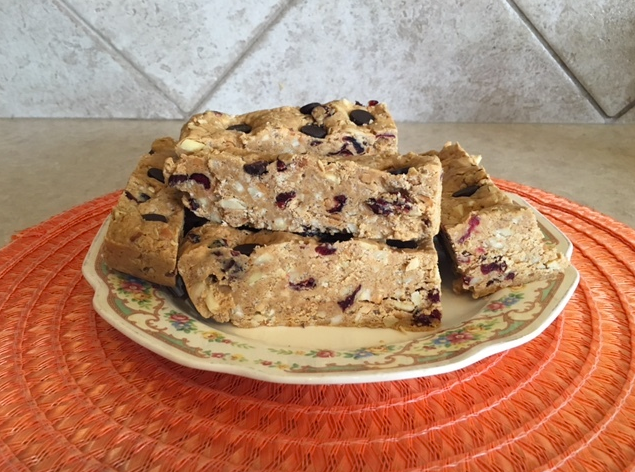 Refrigerate, and then cut into bars – makes approximately 12-14 bars. Keep individually packaged in refrigerator or freezer. **May need to add extra peanut butter - depends on the brand and amount of oil in each brand. I sometimes add an extra ½ cup peanut butter, just keep adding slightly more heated peanut butter until mixture has all dry ingredients completely mixed. Approx. 20-25g protein/250 - 300 calories per protein bar and lots of the good fats. Enjoy!